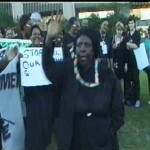 Yet another gathering which has been infused with the spirit of Women in Black is the World Social Forum. The World Social Forum which was created in 2001 is a space for social movements and individuals resisting and in search of alternatives to the process of globalisation and neoliberalism to gather, to share ideas and experiences, to debate and to articulate another vision of a world. Visions that is more rooted in the lifeworlds of those who are at the margins; visions that are more wholistic. The social movements that gather at the forum come from the global south and north and believe in the dream that another world is possible. El Taller International, the AWHRC and Vimochana have been part of the WSF and together with other partner organisations have organised several Courts of Women and Women in Black Vigils at the World Social and Polycentric Forums, Africa and the Asia Social Forum. • At the WSF 2003 held in Porto Allegre, Brazil we held with our partner organisations in Cuba and Latin America the World Court of Women against the Economic Blockade in Cuba. 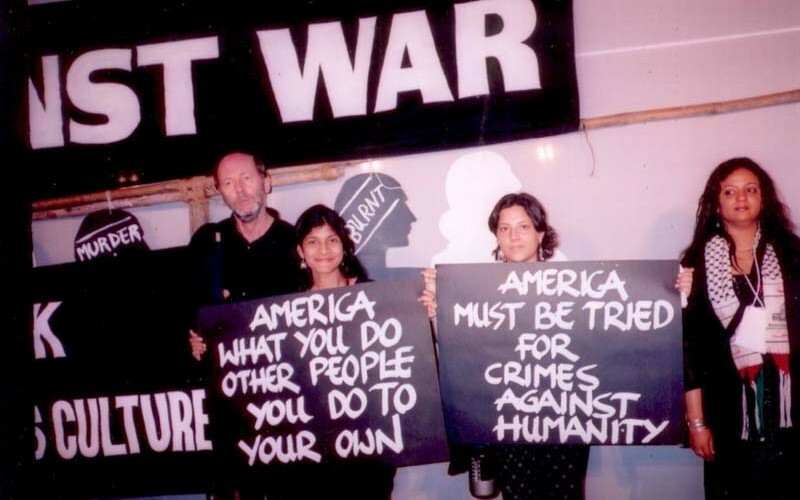 • At the WSF 2004 held in Mumbai, India we held with our partner organisations the World Court of Women on War as Crime (focussing on US war crimes). • At the WSF 2005 held again in Brazil we offered with the Africa Social Forum, the Africa Court of Women on Poverty: Lives, Livelihoods, Lifeworlds. • At the WSF polycentric 2006, we have held the World Court of Women on Resistance to Wars: Wars of Globalisation, Wars against Women in Bamako, Mali, in Caracas, Venezuela and in Karachi, Pakistan. 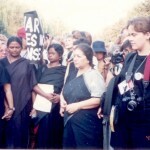 • In January 2003 the Asian Women’s human Rights Council with Vimochana organised Women in Black Against War for Peace at the Asian Social Forum in Hyderabad. • In preparation to the World Social Forum 2004 to be held in Mumbai, there were many country specific forums that were held. 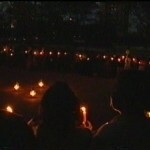 India too held the India Social Forum in Delhi subsequent to the Asia Social Forum in Hyderabad. – initiate a rethink on our analyses of what constitutes dowry in the present context and understand its links not only to other forms of violence against women but also to the larger culture of violence and marginalisation inherent in the contemporary processes of development and globalisation. – reflect on and review the methodologies of redress including the law and revision a mass movement that is multi layered thereby taking deeper root in people’s collective consciousness and in public polity. An action of women and men dressed in black and standing in a public place in the city on the evening before the Court and focusing on the issues of the Court through placards, banners, pamphlets and lamps.